At the 2018 Juno Gala Dinner & Awards on March 24th, Jocelyn Morlock wins Classical Composition of the Year and is joined onstage by Carol Todd, whose daughter Amanda inspired the winning composition. Carol Todd was recently honoured as one of 10 Women of Worth 2018 from L'Oréal Paris Canada. 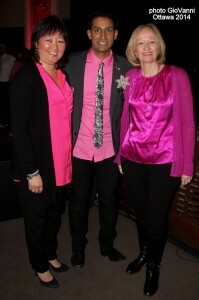 A gala honouring event was held in Toronto, Ontario on March 8th on International Women's Day. Each of the ten Women of Worth honourees received $10,000 to further their charitable endeavours. Each women bravely shared their amazing stories in front of honoured guests. The Women of Worth program honours Canadian women who selflessly volunteer their time to serve and improve the lives of those in need. Selected from an impressive pool of public nominations, each Honouree was chosen by an esteemed judging panel based on the impact of the cause she’s championed and innovation she has demonstrated to benefit those less fortunate. This award honours dedicated community members who make outstanding contributions to ending gender-based violence by speaking up, interrupting and confronting harmful language and behaviour within their community, and who demonstrate courage in opposing gender-based violence. Twenty British Columbians were honoured at the fourteenth annual British Columbia Community Achievement Awards' presentation ceremony held at Government House in Victoria. The Honourable Judith Guichon, OBC, Lieutenant Governor of British Columbia along with BC Achievement Foundation Board members, Robert Louie, OC and Christopher Gaze, OBC presented each recipient with a BC Community Achievement Award certificate, medallion and citation. Scott McIntyre, CM, Foundation Chair, hosted the presentation ceremony. "British Columbia is built on the strength of its communities, and that strength is rooted in the spirit, ideas and passion of the people recognized today," said McIntyre. "Their stories highlight the remarkable diversity of our province and the potential of each and every individual to truly make a difference." 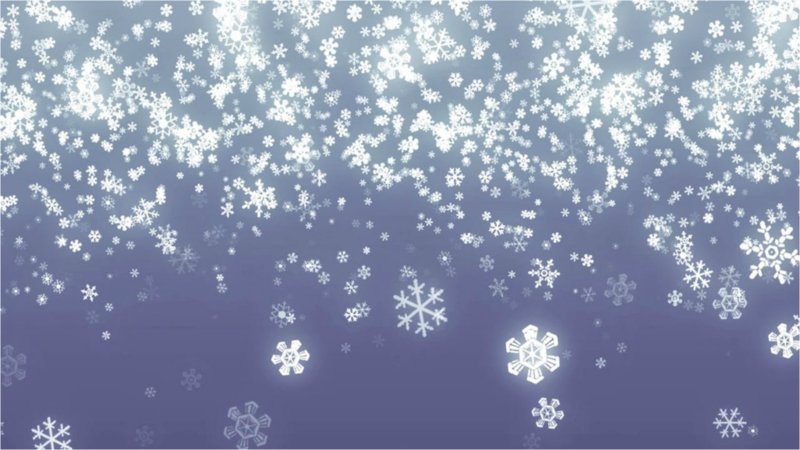 "Carol channelled her grief and professional skills as an educator to become a voice of change. 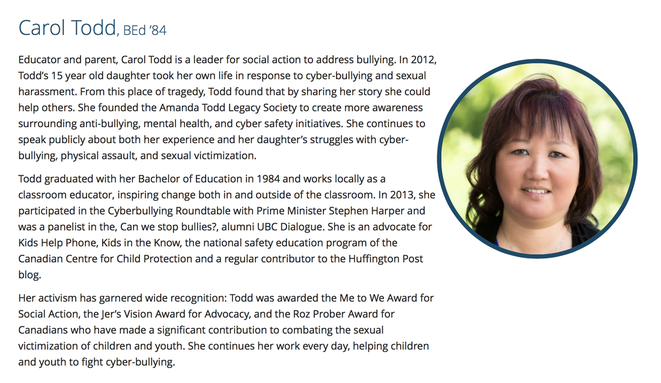 In honour of her daughter, Carol founded the Amanda Todd Legacy Society, which is focused on building awareness and improving the well-being of individuals with respect to bullying, cyber abuse, internet safety and mental wellness. 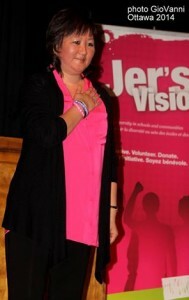 Through her work with the society, Carol has become a highly visible and much sought-after public speaker and advocate. She has educated thousands, influenced policy and awarded grants to numerous community-based organizations. She is an advocate for Kids Help Phone, an Ambassador for the Canadian Centre for Child Protection and has received numerous awards for her efforts including the Me to We Award for Social Action, the Roz Prober Award and the TELUS WISE Outstanding Canadian Award for Cyber Safety." "Carol Todd is an outstanding individual who turned adversity into strength, not only for herself, but for her community. Carol suffered a tremendous loss when her daughter Amanda took her own life. However, she channeled this into an initiative that aims to educate the public on mental health and bullying while supporting those who are currently suffering from either issue. The Amanda Todd Legacy is an organization that is truly changing the youth perspective of mental health and bullying in Canada." ​ Everyday Political Citizen (EPCitizen) is a project to tell local stories about Canadians' participation in their democracy. Carol Todd of Port Coquitlam, British Columbia was nominated by Ron McKinnon, MP for Coquitlam-Port Coquitlam and was one of 108 EP Citizen's nominated in the over 30+ category. She was then shortlisted with voting taking place from a list of chosen jurors. 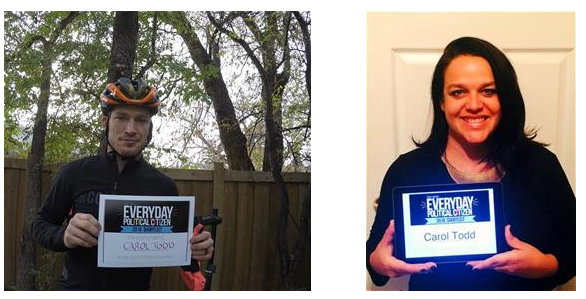 Juror Andrew Ference says: "Carol Todd of Port Coquitlam, BC, is my nominee for the 2016 Everyday Political Citizen. This fantastic woman suffered an unimaginable loss when her young daughter Amanda took her own life after being cyber bullied and harassed. 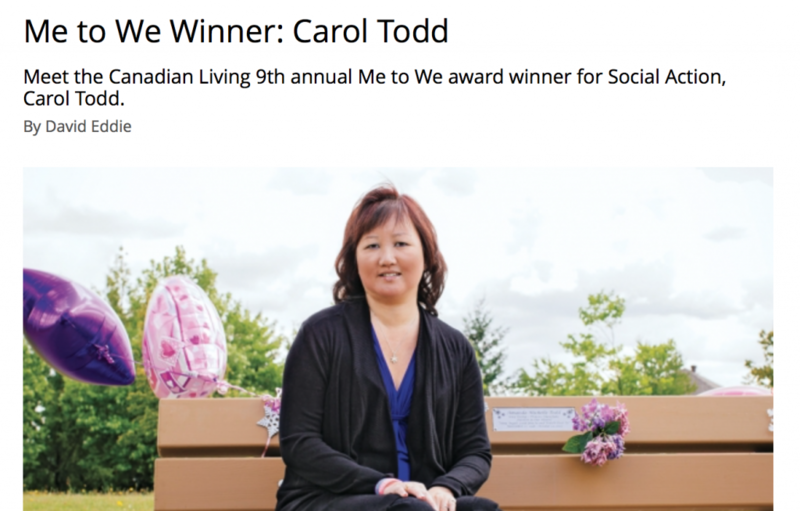 Carol has not only shared her story to shine a light on this serious issue but she has also started the Amanda Todd Legacy organization that is helping youth dealing with mental health issues and bullying in Canada. I not only nominate Carol but applaud her for her bravery and determination to confront this important work." Juror Ilene Sova says: "I have chosen Carol Todd because I find her passionate work on cyber-bullying to be extremely inspiring. She has created a strong legacy in memory of her daughter by working tirelessly to change how we interact in our online communities!" Celebrating 30 years to the protection of all children with the goal to reduce child victimization by providing programs and services to the Canadian public. Award for advocacy. Jer’s Vsion works to eliminate bullying, homophobia, transphobia, and other forms of discrimination in schools and youth communities. The Rosalind Prober Award recognizes Canadians who have made a significant contribution towards combating the sexual victimization of children and youth. This year’s six honourees, who will be recognized at We Day in Toronto on Sept. 20, have fought for an exhaustive list of causes both locally and internationally.